Oil on Canvas "City View"
Anni Løgstrup: Danish artist born 1912. View of the French Riviera. Evening in nice. Oil on canvas. 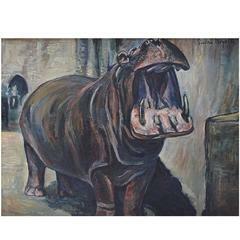 Canvas measures: 49 cm. x 39 cm. The frame measures 6.5 cm. Signed and dated: Lög, 51. In perfect condition. 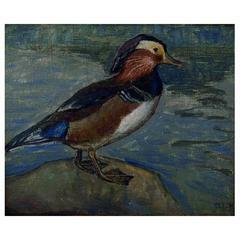 Danish artist, dated 1918 Mandarin duck, oil on canvas. In perfect condition. Signed indistinctly NJ, dated 1918. Measures 35 x 29 cm. The frame measures 6 cm. Unknown French artist, parrots, 1929. Oil on canvas. In very good condition. Signed illegible. Paniez ? 29 Measures: (ex. the frame) 44 x 29 cm. The frame measures 4 cm. 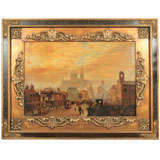 A fine turn of the century oil on canvas of a city view. The interior with a Palace in the distance with people and wagons in the street, circa 1900-1920. In a spectacular frame. "The Fisherman", 1950 Oil with texture on canvas Great perspective work Dimensions: 165 cm L x 132 cm H x 3 cm D.
Original oil painting by French artist Yves Diey (1892-1984). Signed lower right. In excellent condition. 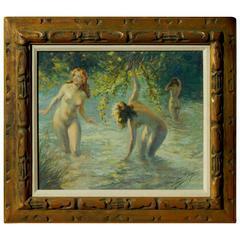 Measures: 18" H x 21 3/4" W. Frame size: 26 1/4" H x 29 3/4" W.
1960s oil on canvas artwork by French artist Charles Levier tittle Dans Le Atelier (1920-2003). Artwork measurements width 30'', height 24''. 1 of 7 pieces from a private collection. Sophisticated still life of spoon in the style of Braque. 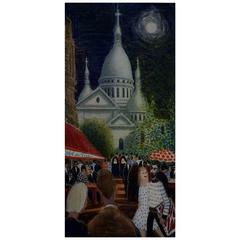 Titled La Louche, oil on canvas by Saint Maur (1906-1970), signed LL, titled and inscribed Paris on the reverse.